The Bacia Grande bowl measures over two feet wide and 10 inches high. It is carved from a single block of high-density recycled cork. It has a rough tooled surface on the outside, and a smooth, leathery surface inside. Sealed with a food-safe mineral oil and beeswax finish. Hand washable. These little painted trees stand 7" high by 4" wide. The cork "trunk" is removable for secretly storing whatever it is you need to get through the holidays in one piece. These floating toys hold up to the roughest bath time waves. The natural cork stoppers are removable to allow for tiny passengers or cargo. Each ship comes packaged in a hand-screened and numbered box by designer Mark McGinnis. These small bowls, turned from high-density cork, evoke the shades of sea, sky and summer fields. 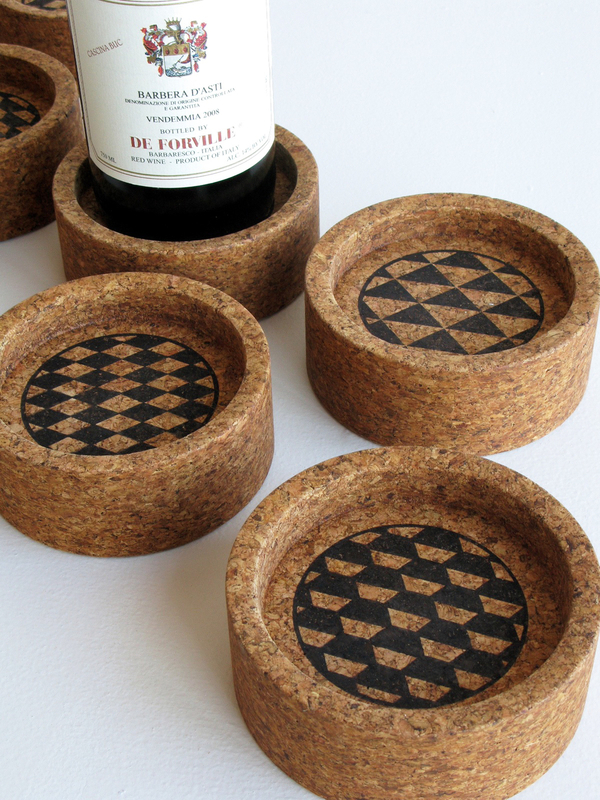 These painted cork coaster sets are made in our Greenpoint, Brooklyn studio. They come in a pack of 4 coasters, and are offered in 3 colorways: all have natural cork with either Sky Blue, Light Grey or Electric Pink paint. Hand wash. These cutting and serving boards are made from a super-heavy, food-safe cork slab. They work as well as any wooden board, but will not dull knives as fast. Sealed with a mineral oil and beeswax finish, and available in two sizes. 12" x 6" - recycled cork, paint. These tabletop display bowls are natural cork on the outside and cool, pastel colors on the inside. For display use only. Part of the AREAWARE product line, 2012. Functions both to wedge a wayward door, or as a small desktop memo board. Handmade in our Brooklyn, NY studios. Raw bark from the Cork Oak (Quercus Suber L.)​ is given a distictly man-made touch and linked into a system of tabletop candelabras. Small (shown) - 7" x 7" x 3"
Large: 12" x 12" x 3"
3 colors: Blue (shown), Orange, Green. A contemporary take on ancient tradition. A slab of sustainable cork with an image of a fancy Hanukkah menorah screen printed on both sides. 9 holes are drilled into the top to accept standard candle sizes. Two sizes, 3 colors. 3 colors: Blue, Orange, Green. Small - 7" x 7" x 3"
11.75" x 1.5" (each). High-density, food safe cork, paint. Almost 2' long, 6" wide. Ebonized White Oak. These wooden ships, made from locally-sourced hardwoods, function as objects for the home. The bridge of each vessel is a removable cork, concealing storage for contraband stashed beneath. These wooden ships, made from locally-sourced hardwoods, function as toys for children or as dishes for adult tabletops The bridge of each vessel is a removable cork, concealing storage for contraband stashed beneath. 10" x 3" x 3.5"
These wooden ships, made from locally-sourced hardwoods, function as toys for children or as dishes for adult tabletops. The bridge of each vessel is a removable cork, concealing storage for contraband stashed beneath. ​Hand washable. Standard wait time is 0-4 weeks. ​5" x 5" x 1"